ID Challenge #3 update: I knew this would be a hard one, and so far nobody has figured this one out (only one commenter got the right order!). I’ve released the comments gotten so far so you can see where things stand, and maybe with the additional information (and my pointing out an important clue) it will be enough for one of you to arrive at a full ID. Further comments are still being moderated until I decide to close the challenge. Right now the points are there for the taking! This past Monday I embarked on an extended business trip to Brazil. “Wow, Brazil!” – you say, and while getting to travel to an exotic tropical locality on my company’s dime definitely rocks, I do have to justify the trip by actually working. Add that to the time involved with planes, automobiles, and hotel transfers, and there is precious little time for more esoteric activities such as photographing insects. It is Brazil, however, and summer at that, so whatever time does become available over the next ten days, I’ll be on it! I’m stationed in Campinas, about 2 hours north of São Paulo, and this evening I had my first opportunity to break out the camera and do a little exploring around the hotel grounds during the waning hours of daylight. I’m not normally one to take short walks just looking for any random insect to photograph, but hey – it’s Brazil! I also don’t normally like to post photographs of insects without knowing much about them – especially their identity. But hey, it’s Brazil! I think I’ll be lucky to figure out most things to family, although I might be able to drill down a little further on occasion. With that prelude, I hope you’ll indulge me these random postings over the next 10 days or so, primarily photographs but perhaps accompanied by a little bit of text. At first I thought this was a member of the hemipteran family Pyrrhocoridae (red bugs), as some North American species have similar coloration; however, members of that family apparently lack ocelli, which this insect clearly possesses. This would seem to indicate instead some species of Lygaeidae (seed bugs), but the forewing membrane with numerous veins arising from a transverse basal vein and presence of what appears to be a distinct metathoracic scent gland opening suggest instead some “unleaf-footed” species of leaf-footed bug (Coreidae). 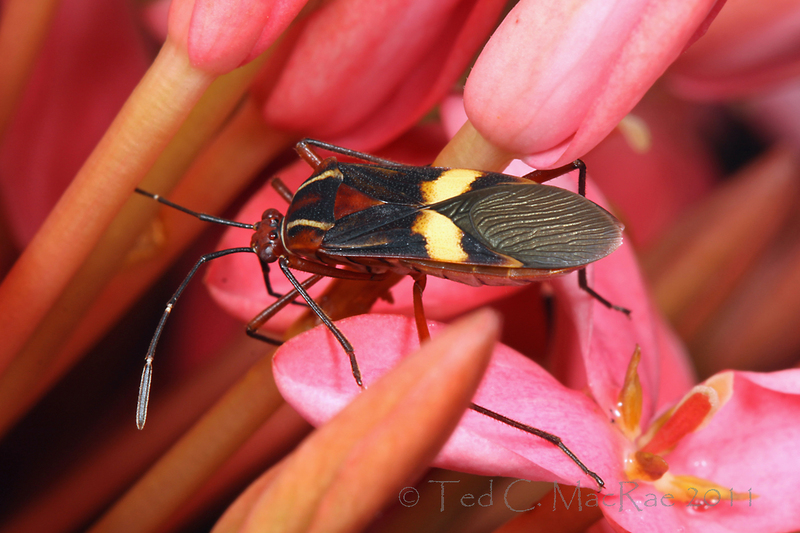 Whatever its identity, I would imagine it is quite distasteful, based on what clearly seems to be aposematic coloration and the fact that there were numbers of these bugs hanging out quite conspicuously on these flowers. This individual was differently colored than the others, but otherwise it seemed structurally and behaviorally identical. Is it merely a highly melanized individual? Maybe a case of sexual dimorphism, and I only saw this one individual of one of the sexes? Maybe it truly is a different species – it is Brazil, afterall! Daylight began to slip away much too soon, and I was about to pack it up when I noticed some blurs at the flowers. I realized that moths had begun to visit the flowers in the obscurity of dusk and became determined to photograph one, despite the fact that they never actually landed on the flowers but hovered in front of them instead. It was quite difficult to even get them framed in the viewfinder, and on those few occasions when I managed to do this it was all but impossible to spend any time trying to focus – I used the lamp on the flash unit to help me see the moth, then just framed and quickly took the shot. This one actually turned out not too bad – a little bit of blur in the wings but otherwise acceptable enough to let me tentatively identify it as Pseudoplusia includens (soybean looper). Brazil is well on its way to becoming the world’s largest producer of soybean, and the caterpillars of these moths are enjoying the bounty! I saw one last moth before the final traces of daylight disappeared – I don’t have any idea about its identity, but it’s a pretty picture nonetheless. It has the generic look of the large family Noctuidae, so that’s what I’m gonna go with until somebody tells me differently. Edit 1/20/11 – Somebody just told me differently! According to Chris Grinter, this is a species of Crambidae, possibly Herpetogramma phaeopteralis (tropical sod webworm). Thanks, Chris! I don’t know the name of the plant whose flowers these insects were visiting, but the hotel staff has promised to ask their gardener in the morning and let me know – now that’s service! 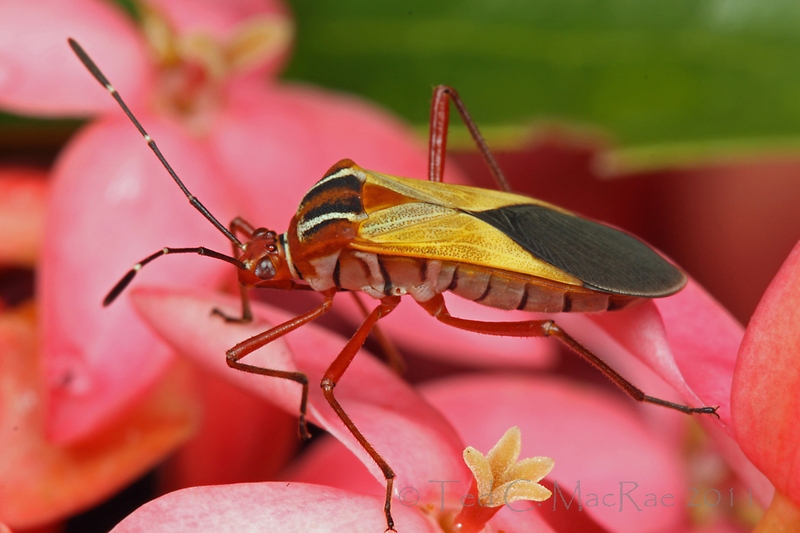 This entry was posted in Coreidae, Hemiptera, Lepidoptera, Noctuidae and tagged Brazil, bugs, entomology, insects, leaf-footed bugs, moths, nature, science, warning coloration. Bookmark the permalink. 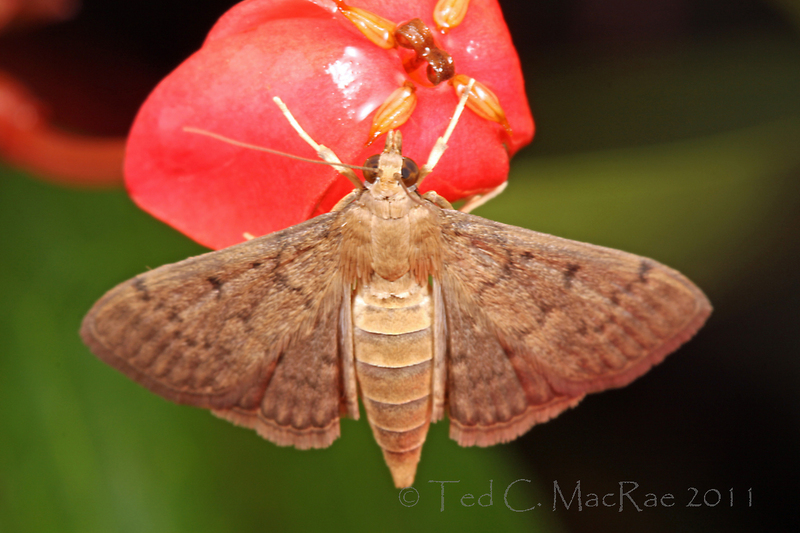 That last moth isn’t a Noctuid, but a Crambidae. 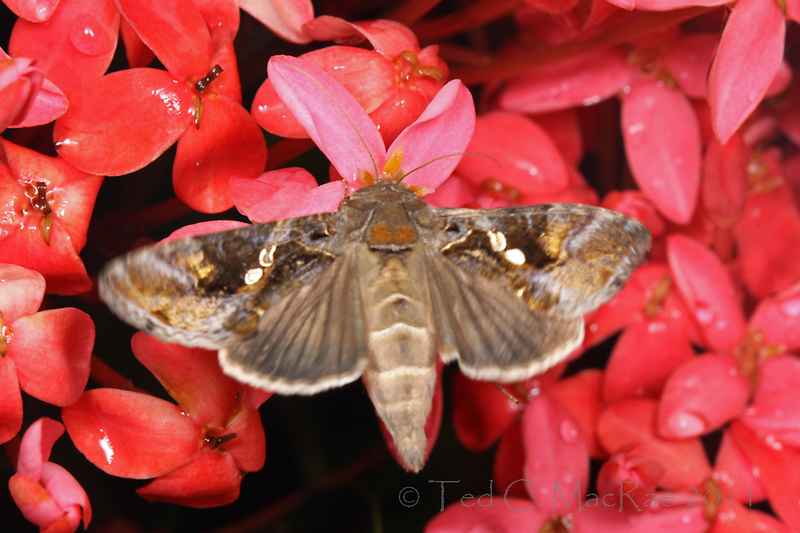 At minimum it’s in the subfamily Pyraustinae, and I would even bet on this being Herpetogramma phaeopteralis. It’s the “tropical sod webworm” and is known from here down to South America. Keep the moth photos coming! Cool – thanks for the ID, Chris! I’ll edit accordingly. Do you agree with Pseudoplusia includens for the first moth? There’s no way any one person could possibly know every species of insect, but you seem to do pretty dang good! Thanks for sharing the shots, hope you manage enough time for many more. Have a safe, and enjoyable trip. Thanks, Tom. Hopefully I’ll have some free time over the weekend. Love the color variation in those coreid (?) bugs. Sorry to miss your talk, James – I don’t know if I’d say the work part is something better to do (although I am enjoying it), but I’ll be much happier if I can get a good solid block of time during the day to really look around somewhere. The work aspect might not be better, but being in Brazil is. I lived there parts of 1984-85, and seriously thought about trying to find a job and spend the rest of my life there. (At the time, my Portuguese was good enough — could be again with a few weeks of tuning up). Saudades – Ask a Brazilian. I should clarify – Yes, the work part is better also! I came here many times for work during the late 90s and early 00s – the last time being in 2002 (on the day they won the World Cup – talk about crazy!). It’s really nice to be back after so long without it. If I ever get the chance to live in South America, my first choice will be Quito (but really I’d take just about anywhere). Hello there! I’m from Brazil, those two hemiptera are indeed Coreids. I believe that they belong to the Hypselonotus genus. Thanks, Matheus. Yes, they were subsequently identified as Hypselonotus interruptus by Harry Brailovsky of UNAM (see this post). Pretty little things!